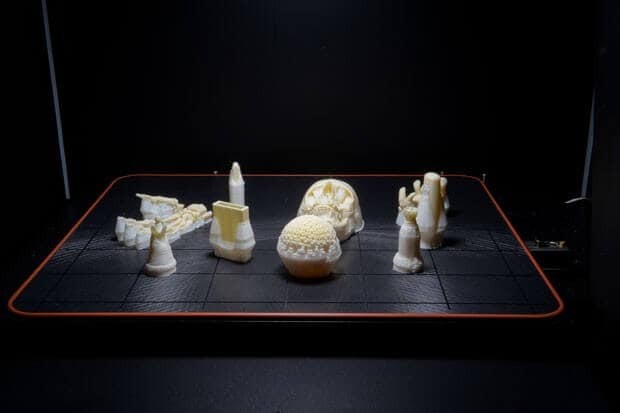 Fortus 400MC 3D printer Review 2019 - Is It Worth The Money? Today, we get our hands on another offering from 3D printing stalwart, Stratasys, with the Fortus 400 MC. 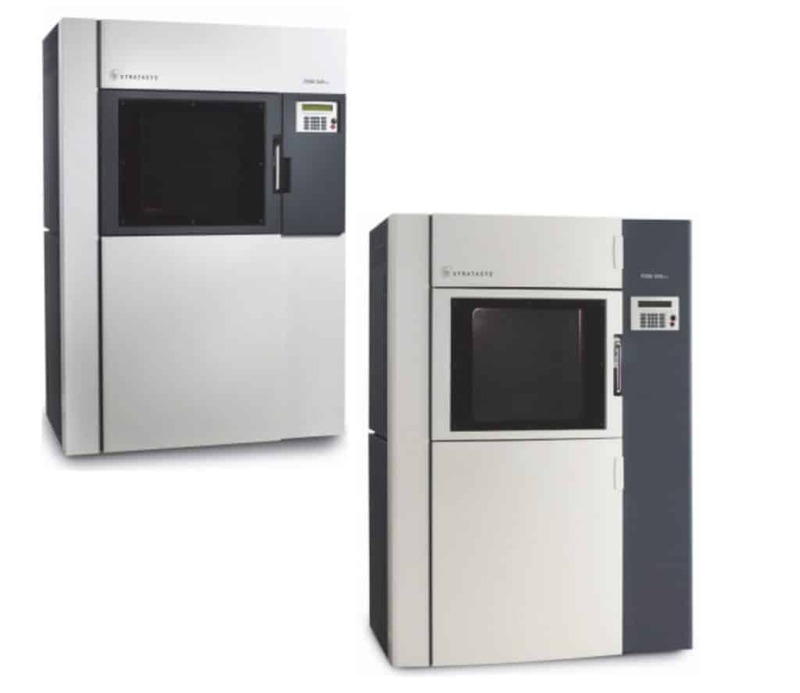 Not so much a 3D printer as a 3D production system if we go by the marketing documentation written up Stratasys, the Fortus 400MC is more akin to a supersized double fridge than the small compact hobbyist alternatives we are accustomed to reviewing here at 3D Beginners. So, what does this beast of a printer have to offer and does its printing prowess match up with its imposing size? Before we go any further, let’s specify that the Fortus 400MC is among the largest printers on the market with a footprint tallying up to a flabbergasting 1281 mm x 895.35 mm x 1962 mm with a total weight of 593 kg. Rest assured this is not an error on our part; the 400MC does indeed weigh upwards of a ton. Suffice to say it won’t fit in most consumer workshops and if we are practical, needs a room all to itself. 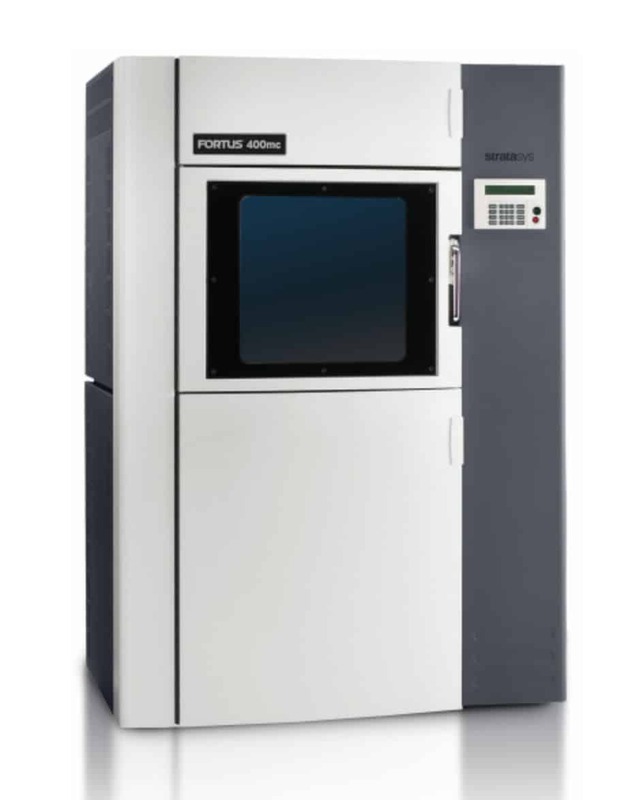 Size aside, the design of the Fortus 400MC is reminiscent of an MRI machine or large scale microscope with a clean, smooth contoured look complimented by a black and white color scheme. It isn’t the prettiest printer around, but then again it doesn’t purport to be as it is through and through an industrial grade printer to be used in busy research and development labs rather than displayed among sleek home office devices. The chamber is fully enclosed for maximum temperature control and comes with a variety of doors to access different parts of the printer including a canister bay door, oven door, and more. Most of these access points are reserved for servicing, and the Fortus 400MC is designed so that the oven door opens easily for access to the print bed. 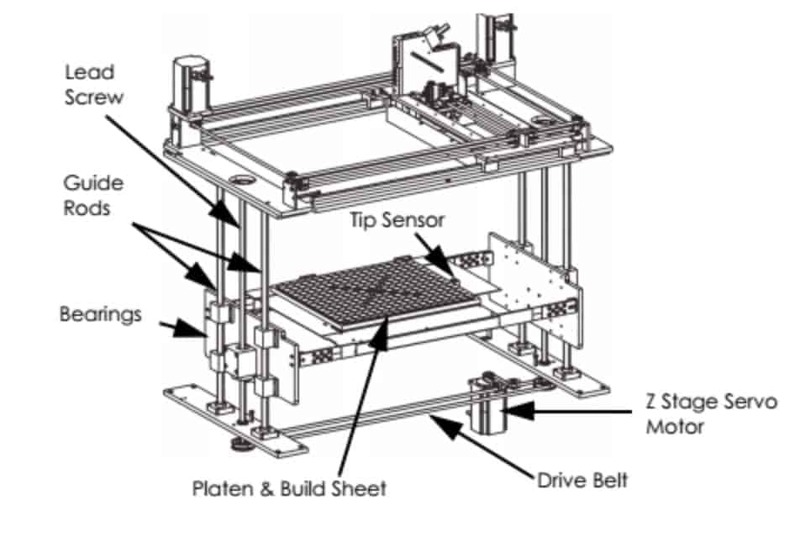 For such a large machine, the Fortus 400MC uses standard FDM technology with a meaty XY gantry running on belted servo stepper motors as well as a beefy Z- stage running on two belt driven lead screws powered by another servo stepper motor. 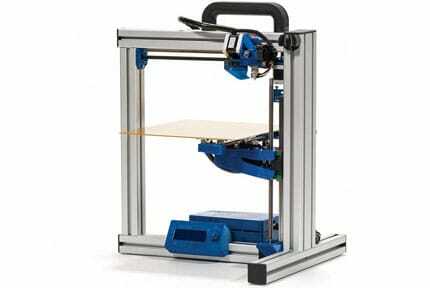 The printer is available with a build volume of either 355 mm x 254 mm x 254 mm, or 406 mm x 355 mm x 406 mm. The size is enormous but is appropriate given the size of the machine. Resolution wise, both the X and Y axes are accurate up to 600 dpi, while the Z-axis reaches 1600 dpi. Layer resolutions range from 127 to 330 microns depending on speed and the type of material being used. 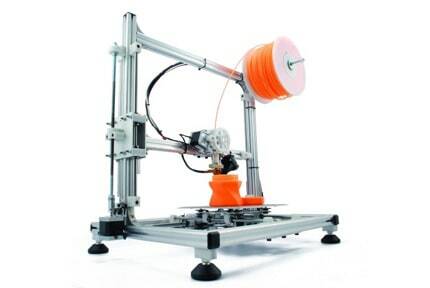 A dual extruder setup can produce standard filament as well as support structures simultaneously. It can reach temperatures up to 415 degree Celsius. 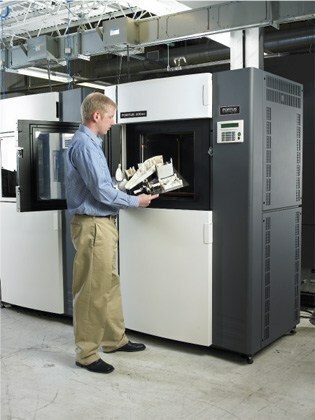 The chamber, or oven as Stratasys fittingly calls it, can reach an ambient temperature up to 225 degrees Celsius. The build platform is rather interesting as it incorporates a waffle pattern on the top surface that allows a vacuum to hold the one time use plastic build sheet on which models are deposited in place across its entire surface. The Fortus 400MC is also fitted with an automatic tip cleaning mechanism consisting of brushes and debris chutes that clean the extruder tips of any filament build up. Additionally, the Fortus 400MC has an inbuilt air dryer system that rids loaded filament from damaging moisture. The size of the Fortus 400MC is somewhat of a mystery at first, but when we find out it is compatible with a headache-inducing litany of materials, it all starts to fall into place. 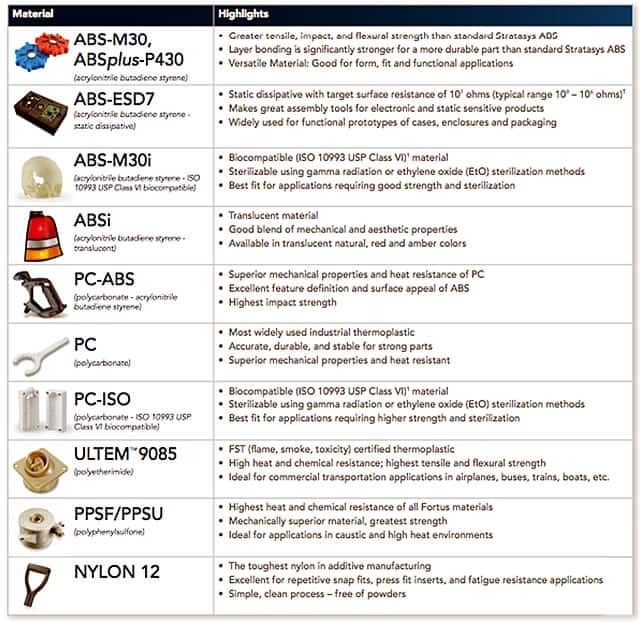 It supports ABSi, SR-20, SR-30 ABS-M30, ABS-M30i, ABS-ESD7, ASA, FDM Nylon 12, SR-110, PC-ABS, PC, PC_S, PC-ISO, ULTEM 9085, ULT_S, ULTEM 1010, U1010S1, PPSF, and PPSF_S. Put simply, it handles all manner of ABS filament, alongside a healthy array of support materials. Materials are available in Stratasys’ propriety canister format. Each canister is equipped with an encoded SmartSpool chip that monitors filament/support levels and types. 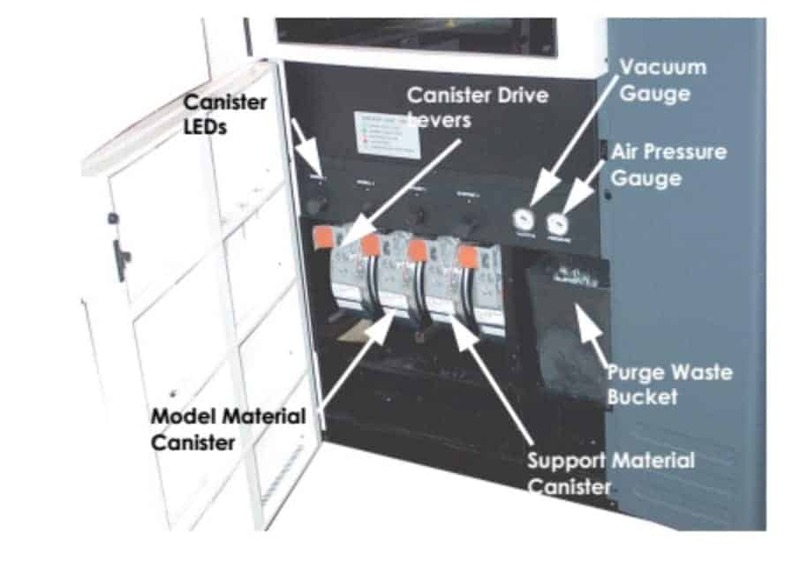 The canister drive can house two material canisters and two support canisters and features vacuum and air pressure gauges alongside an LED system for monitoring material/support levels. The Fortus 400MC is controlled by a four-line 40 character monochromatic control panel and keypad. The controls are arranged in intuitive menus that are easy to navigate and allows users to tinker with material loading/unloading functions, opening/closing the various doors, monitoring the system, monitoring material status, monitor print job progress (run time, estimated finishing time, build height, etc. ), turn the printer on/off, network settings, job queue and more. Connectivity is assured through Ethernet, which is typical for industrial grade printers and allows access to an extensive network of workstations for rapid print triggering and monitoring. Finally, to round off the features, the Fortus 400MC runs with the Stratasys engineered job processing and print management software tandem of Insight and Control Center. There’s no support for third-party, but then again this is pretty standard for large scale printers. The Fortus 400MC is very much sold as a printer and service package with installation and servicing guaranteed by Stratasys. As such, there is no assembly or setup. 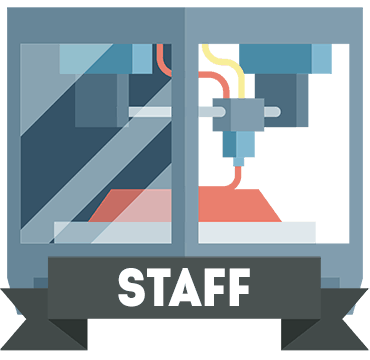 If a Stratasys technician doesn’t cover the setup, technician training is available for in house assembly and maintenance. The printer arrives with a user guide, start-up kit, quick reference card, ethernet cable, vacuum plate, filter, bulb, Kapton catcher, consumable brush assembly, consumable shim, purge ledge, canister box, kit tray, brush, cutters, wrench, scraper, screwdriver, pliers, tweezers, magnifier, knife, magnetic scriber, hex ball end, long arm key, chute cleaner, cotton wiper, gloves, and sleeve. The quality of the prints produced by the Fortus 400MC rivals that of injection-molded alternatives with a faithfulness that is nearing impeccable regardless of the material used. Our tests rendered robust, highly finished, and splendid looking tests with every use. We found it ideal for all steps of the manufacturing process from early prototyping to near end-user products. The range of resolutions and speeds means it can produce high quality, complex geometry models as well as rough and ready test prints in equal measure. Stratasys offers a comprehensive service deal that ships with every unit including access to a dedicated phone/email team, alongside site visits for maintenance and repairs. The warranty on the Fortus 400MC is a comprehensive one year deal that covers all eventualities. The Fortus 400MC is a versatile and robust machine that should suit designers and engineers alike especially those that require faithful prototypes for mechanical and pre-manufacturing tests. The print quality is unsurprisingly excellent and worthy of the price tag and size of the printer. It is geared towards large part production, and it is within this realm that it truly shines. As such, workshops with small part requirements may not benefit fully from the might of this behemoth. Equally, those that require multiple filament type extrusion won’t find much use for the Fortus 400MC, but these are the only real criticisms we can level on this device. A complete package with a massive build area and an eye-watering range of materials, the Fortus 400MC is a reliable workhorse any professional manufacturer would benefit from immensely.